Wario City in the daytime (left) and nighttime (right). Wario City is a baseball field in Mario Super Sluggers. 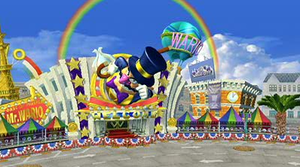 The field is set in the middle of a bustling city, with a large billboard (disguised as a building) featuring Wario's head popping out of the front. The manholes on the stadium occasionally shoot out water, in an attempt to knock players out. There are also arrows located across the outfield. If a ball lands on one, it will bounce in the direction of the arrow. Also, the center field is a bit shallow. The stadium's obstacles do not change at night, but the graphics do. The stadium seemingly resembles New York City or Las Vegas and may be a reference to Diamond City. It is home to the minigame, Gem Catch. Information: There's not a trickier place for visiting teams than the Big W. Wario City is a paved field where street rules apply. A manhole might pop up in your way, or a traffic arrow could redirect the ball when you least expect it. 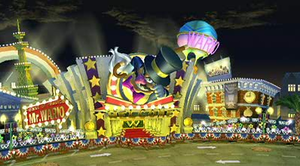 Fun Fact: Wario City boasts the liveliest nightlife of all the stadiums in Baseball Kingdom. This page was last edited on October 25, 2018, at 22:46.